The only track by this expressive singer that anybody has heard of is his “tough times” song “Hard Row To Hoe” which has become rare and expensive now that the dancers are all over it. And I like it’s “Tobacco Road” styling a lot. But to ignore his other tracks is to do him a big disservice – so I’ll try to broaden the horizons a bit. The flip They Say I’m A Fool for example shows off his dark, rich baritone voice rather well and the gently loping “I Wanna Be Loved” is a really catchy number that stays in the mind. But the two part Baby I Love You may well be his best cut. 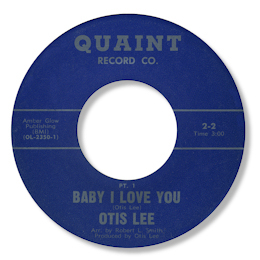 It is chock full of good things like the chord changes, great churchy piano and a fine horn arrangement but the main action is Otis’ wonderfully drawn out vocal. His excursions into high tenor range are beautifully done and the way he lingers over certain phrases shows his absolute mastery of tempo. Does anybody know where he came from? Could Quaint be his own label? 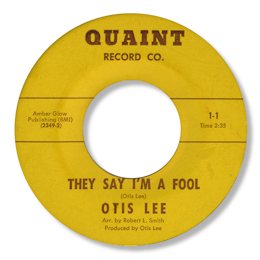 Note ~ The odd numbering of the Quaint 45s in the discography is correct.